This article is a short summary of Tingle's Balloon Fight DS. 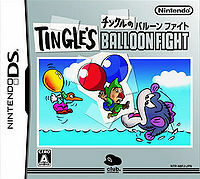 Tingle's Balloon Fight DS is a video game made for the Nintendo DS released in 2007 exclusively for members of Club Nintendo in Japan. This game is a remake of the game Balloon Fight for the Nintendo Entertainment System and stars Tingle as the main playable character instead of the original character from Balloon Fight. This page was last edited on 10 July 2015, at 00:50.